If you have a peanut allergy but still crave a nutritious similar type of spread, you might need to look into nut butters such as the ones I received from Artisana Organics. The Artisana organic raw nut butter assortment provided to me for review could be the answer to solving that difficult allergy problem. All are strictly manufactured in a peanut and gluten free facility and are delicious substitutes. I received a Coconut Butter and a Walnut Butter, both 8-oz. 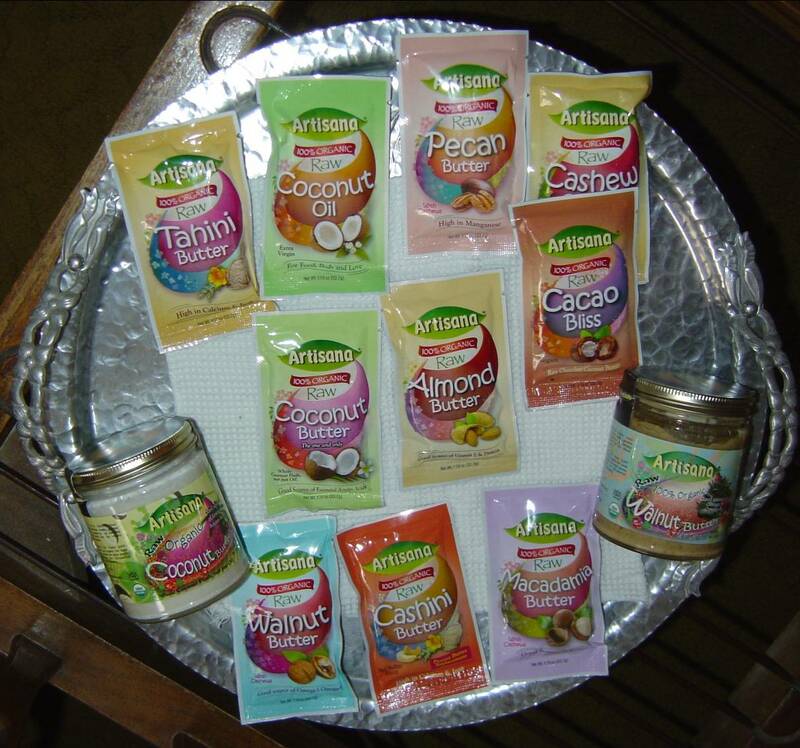 jars and a variety of their 1.19 oz pouches with Almond, Cacao Bliss, Cashew, Cashini, Coconut Oil, Mac-Cashew and Pecan as well. My favorite of the Artisana Organics nut butters was their Walnut Butter, which would please any peanut butter lover. This butter spread well in a sandwich or on crackers and tasted deliciously nutty plain. The Cashew, Almond, and Pecan varieties also were top contenders in the taste department. The Tahini had a stronger flavor, slightly more bitter alone. However, I added some grape jam to the Tahini butter and made a wonderful sandwich. The Coconut Butter definitely tasted of coconut and by adding a bit of Tropical Traditions raw organic honey, (which is currently on giveaway), I created a new lunchtime treat. Plain or with some honey, I experimented with the Cacao Bliss, Cashini, Coconut Oil, and the Mac-Cashew, with pleasing results. Whether a peanut allergy is your problem or not, Artisana Organics nut butters are wonderful changes for any nut lover wanting new taste possibilities. You can do a lot with these nut butters and from eating them plain to adding different jams, cream cheese, sliced bananas, etc. Furthermore, they come in both jars and in pouchs, which are perfect to pack in your handbag or briefcase, for some quick energy. Artisana Organics and their delicious organic nut butters can offer a wonderful alternative for those seeking peanut butter replacements or new tasty nutritional spreads. Check their website out because you will love their products. the cacao bliss sounds…well, blissful! I really want to try the Almond Butter and the Walnut Butter. I'd like to try the raw cashew butter (as I am sensitive to most other nuts and have to avoid them). I want to try the Coconut butter! I'd like to try the Almond Butter. I would love to try the Raw Organic Almond Butter.